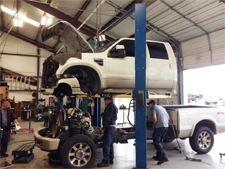 The professional auto technicians at our auto shop look forward to servicing Domestic, Asian and European vehicles owned by residents of Austin, Manchaca, West Lake Hill and the surrounding area. Our shop employs ASE Certified Technicians and we're an Authorized Bosch Service Center, meaning you're going to get the best parts and service possible. If your car, truck, van or SUV needs engine repair, brake service, scheduled maintenance or another service call us to request an appointment for quality auto maintenance in Austin today! At Oak Hill Automotive our team is committed to providing amazing auto repair paired with outstanding customer service. We offer truthful advice to drivers in the Austin area because we know honesty is what earns trust and business. We understand that your vehicle is a valuable investment and that you need it to keep up with work, errands and relaxation. We promise to do our best to get your car in and out of the shop as quickly as possible while completing the necessary service or repair with the highest level of professionalism.